Marchers took to streets to denounce lavish public spending on a sports tournament in a nation with profound social needs. Protesters and Brazilian police clashed in Sao Paulo, Rio de Janeiro and at least three other World Cup cities on Thursday ahead of the first match of soccer’s premier event. Just after the match started, about 300 protesters demonstrating against the World Cup marched along Rio’s Copacabana beach and stopped outside the FIFA Fan Fest — a closed and secured area on the beach where hundreds of fans are watching the match on a massive screen. The protesters were carrying banners with slogans knocking the Cup. 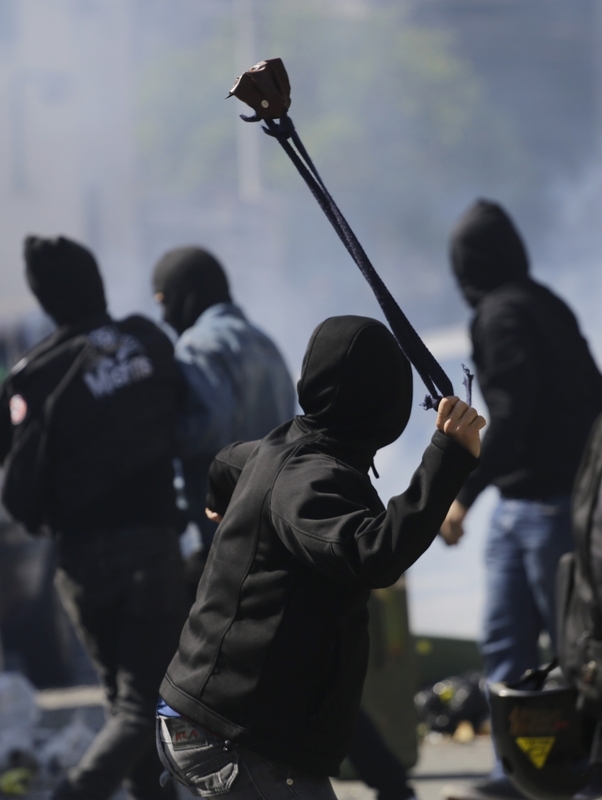 The protest was peaceful, but there were worries that violence could break out as several adherents to the anarchist “Black Bloc” tactic were seen in the crowd of demonstrators in Copacabana. In Sao Paulo, more than 300 demonstrators gathered along a main highway leading to the stadium in Sao Paulo. Some tried to block traffic, but police repeatedly pushed them back, firing canisters of tear gas and using stun grenades. The flow of traffic to the arena was not blocked. Later, a group of fewer than 100 protesters gathered near a subway stop about 8 miles (13 kilometers) west of the stadium. No protests reported near the arena itself. A few protesters suffered injuries after being hit by rubber bullets, while others were seen choking after inhaling tear gas. An Associated Press photographer was injured in the leg after a stun grenade exploded near him. CNN reported on its website that two of its journalists were also injured. In the crowd were anarchist adherents to the “Black Bloc” tactic of protest, a violent form of demonstration and vandalism that emerged in the 1980s in West Germany and helped shut down the 1999 World Trade Summit in Seattle. 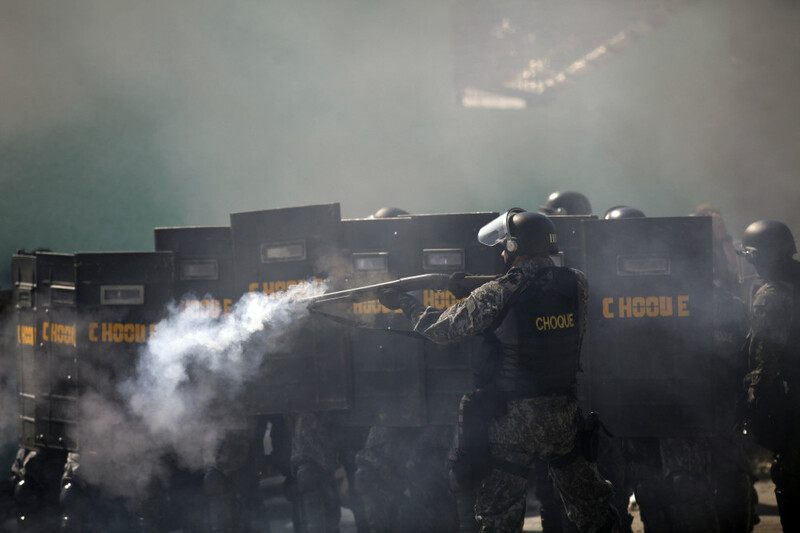 Such Black Bloc protesters have frequently squared off against police in several Brazilian cities in the past year, as a drumbeat of anti-government demonstrations have continued since a massive wave of protests hit Brazil last year. Meanwhile, about 300 protesters gathered in central Rio de Janeiro in another demonstration against the World Cup. Police started using tear gas and took a few protesters there into custody, as marchers took to streets to denounce lavish public spending on a sports tournament in a nation with profound social needs. But that protest also mostly dissipated a few hours before the match. 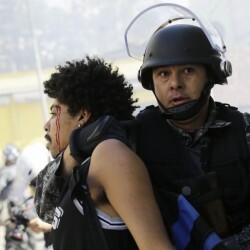 In Belo Horizonte, another Cup host city, about 200 protesters clashed with police at a rally against the event in a central plaza. Some demonstrators smashed the glass doors and windows of two banks. The protest has started peacefully but escalated, with the violence forcing at least one nearby hotel to shut its doors and ask guests not to go outside. In southern Brazil, Porto Alegre, another host city, saw about 1,000 people gather for a protest against the Cup, with some breaking windows and hurling stones at police, authorities said. Black Block demonstrators smashed the windows of a few businesses, including a McDonald’s restaurant. Others tossed over garbage bins and set them aflame. A group started to march toward the city’s FIFA Fan Fest area, but police dispersed them with tear gas and rubber bullets. About 150 protesters in the capital city of Brasilia were also scattered by police using tear gas and rubber bullets, according to the Estado de S.Paulo newspaper. Authorities confronted the demonstrators as they tried to march on the FIFA Fan Fest. The demonstrations in recent months have paled in comparison those last year, when a million people took to the streets on a single night airing laments including the sorry state of Brazil’s public services despite the heavy tax burden its citizens endure. Those protests were largely spontaneous and no single group organized them. Because the recent protests have been organized by established groups, there are leaders with whom the government can negotiate. Fleischer noted that federal officials recently convinced a large activist group of homeless workers to not demonstrate during Cup. But there will remain remnants of protests because people who adhere to the Black Bloc movement and other “anonymous groups are difficult to negotiate with because they have no leaders to dialogue with,” Fleischer said.